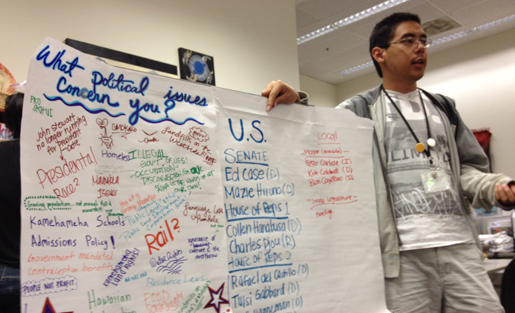 University of Hawaii student Kaui Yogi participating in a May 2012 community discussion on what political issues matter most. 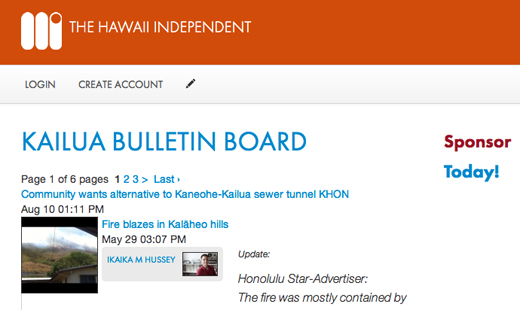 This is one way the Hawaii Independent gathers input to frame electoral coverage. The Hawaii Independent started as a standard, albeit small, for-profit corporation five years ago. A handful of local investors put their money into the local news venture built by a group of local journalists and activists, including editor and publisher Ikaika Hussey. But after several years, Hussey went back to those investors and pitched a switch to a cooperative business model for the news organization. The change happened earlier this year; he mentioned the plans during the Journalism Accelerator forum on local and niche news sites last February. We called him recently to follow up and learned that the Hawaii Independent now offers both subscriptions and ownership, with different benefits, following international cooperative principles and guided by organizational bylaws. 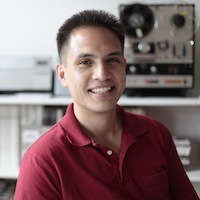 Hussey is inspired by The Banyan Project, his belief that independent media must be locally owned, and a vision of community contributors building solid journalism. The Hawaii Independent was profitable last year, and Hussey intends to send all member-owners a check at the end of 2012. This interview has been edited for clarity and length. Ikaika Hussey: We started almost five years ago. It was myself, and journalists from our local weekly publication and a couple other small publications. We got started because there was a need to tell stories that weren’t being told. I come out of a community organizing background, and my work was primarily working with reporters to understand social and political issues. So I already knew of a lot of stories that needed to be aired. And something that’s been really dear to me is the notion of local community ownership of media. Right now in Hawaii there is a monopoly print newspaper, the Star Advertiser, which is in an alliance with the monopoly television … three television stations that work together; they sell ads on each other’s stations and they share content. I believe strongly that we need an alternative to that. Right now in Hawaii there are only a few very small publications. We’re the only ones that are locally owned. Why is community-owned media important to you? IH: It’s important because Hawaii has its own history — our own history of independence and of our own country. What’s happened in the last hundred years has been the taking away of control over our local institutions by U.S. national conglomerates. In the past two years, one of our newspapers bought the other one and then it was bought by a Canadian company. So there was the feeling of a loss of a local institution. We need an institution that’s going to be here for the long haul. And I think the only way to do that is still the community-owned, truly community-owned institution — not just one that’s owned by a person of large wealth. It has to be rooted in the community. Kind of like the Green Bay Packers. IH: People buy shares. Once they buy a share, they can elect our governing board and help us set our editorial direction. They also get discounts at businesses that we work with. We’re building partnerships with, for instance, local art institutions. We’re creating special opportunities for our members. It’s pretty simple. And we’re still very new to this. We haven’t figured out a way to market it in a mass way. So we’re just promoting it on our website. What I’m really happy about, even though it’s still a very small enterprise, is that it’s growing on its own. I haven’t bought ads to promote it, and every few days I see a few more people who have bought subscriptions and memberships, which is really nice. When you were in the Journalism Accelerator forum in February, you were talking about reincorporating. What changed? IH: Before we were a straight C corporation, just a standard small business with a handful of community investors. We spent a lot of time actually talking with attorneys, trying to figure out a way to become a publically traded company only within the state of Hawaii. But we discovered that would be very expensive. So we decided it made a lot more sense just to reincorporate as a co-op where we could accomplish a lot of the same goals, which is broad, based local ownership. Most of the co-ops I’m familiar with, like REI and food co-ops, give owners a share of the profits. Is the co-op here set up to give owners a share of profits? IH: It is, and we should be able to do that. We were profitable at the end of last year, so we’re on track to do it again this coming year. What kind of check do you think people are going to get back? IH: Oh, billions! (Laughs.) We’re going to give something back. I don’t know what the dollar amount is going to be. Does being a co-op allow you to accept grants? IH: As we’re structured now, no. And we’ve never accepted grants. We’ve always run the Independent as a for-profit enterprise. What is your secret to being profitable? How do you balance how much journalism and how much sales you need to do in a typical day? IH: A typical day is usually lunch with a business owner, coffee with a business owner; reading through all our local news sources; curating stories from them; working on individual stories that I am working on; assigning stories to freelancers; and then going to pick up my kids. Do you run into conflicts of interest being in a relationship with business owners where you are trying to sell them something, and where you might need to cover them? IH: No, we don’t do a lot of coverage of local businesses. We mostly cover public policy, broadly writ — government, civic issues. I have experienced problems where I had to think twice about what I was doing, and what it makes me want to do is both hire more journalists and hire more salespeople, so that we can more cleanly draw that line. Are there any challenges that you’ve run into setting this up as a co-op that you really think people should know as they’re considering this as an option? IH: There are always challenges. I had to talk to my initial group of investors and let them know that they are no longer going to be able to make voting decisions based on the quantity of shares that they own, that it’s going to move to “one man one vote.” Thankfully I’ve been working with a group who were fine with that. In fact, some of them really loved the idea, because their heart is in democracy and community ownership. What exactly do members vote on? What authority do they have? IH: The principal authority is to vote on our board. That’s kind of the same kind of power you would see in any corporation. The difference is only how the voting is structured. It’s “one man one vote,” rather than using the quantity of shares to figure out how many votes you get. What sort of influence can members have on what news is covered? IH: We’re still figuring that out. I’d like us to start doing community gatherings where we talk about the stories which we are going to be covering, prospectively, engage the community in thinking about what are the questions that we need to ask, and then from there, going out and assigning stories and figuring out all the different pieces that need to be done — proactive community engagement in terms of what should be news. I’ve also wanted to do an online forum for members to talk about the stories before they’re reported — sort of like an editorial meeting, but having the discussion be done asynchronously online. Does the board of directors set editorial policy? Or is the board of directors more focused on the profitability? IH: Our corporate board doesn’t make editorial decisions. Right now we have an advisory editorial board, which is basically senior journalists who’ve worked in Hawaii for years, who understand stories, and they sort of advise me on where we should be looking editorially and what we should be doing. One thing I’m building into our website is the ability for members to create their own blog, their own section of the site that they can update whenever they want to, and forms for members to post their own reports. So, for instance, if a member goes to a land board hearing, or any kind of public hearing, the form would have preset questions they can answer. And at the end you have the basics of a news report that our journalists can then pull from and say, OK, these people who are sort of like our stringers, but they’re our members, our eyes and ears in the community, this is what they’ve said, this is who was at the meeting, according to folks who were there. The point I’m trying to make is that there are ways I think to engage members constructively. I’m less worried about influence. I really want the website itself to function sort of as a social network, to engage all these people in that editorial process — and a product of the community is solid journalism. Does a cooperative business model sound like it would work for a news site in your community? In the comment thread below, please tell us what you think the challenges and opportunities might be. And if you’re interested in the possibility of starting a news co-op, check out the recently revised bylaws of the Hawaii Independent that Ikaika Hussey kindly shared for inspiration or guidance. This publisher profile originally appeared on the Journalism Accelerator. Wow. I got here through researching the hate-speech this guy promotes. I lived on the Big Island for a few years and understand why the hate exists. But I’m very surprised any PBS editor would give this guy time of day and believe Emily Harris and all of her supervisors should be reprimanded for giving this profiteer-of-racism the slightest bit of credibility/publicity. Bad job.